Current results regarding the validation of non-formal and informal learning at a European level illustrate that the EU Council Recommendation of 20 December 2012 is having an effect on the structuring of national strategies and general prevailing conditions. Against this background, how is the situation in Germany to be evaluated? In this interview, Professor Peter Dehnbostel reveals the role played by non-formal and informal learning in vocational education and training and in the world of work. He describes how these experiences can be used to inform the development of a national validation system that will enable the benefits of validation to be recognised by individuals, company and educational institutions and facilitate the implementation of validation concepts at this level. BWP Professor Dehnbostel, the EU Council Recommendation calls upon the member states to introduce national strategies for the validation of non-formal and informal competences by the year 2018. How should the current status of development in Germany be evaluated? DEHNBOSTEL There cannot really be any talk of a national strategy in Germany. The focus is much more likely to be on the development and piloting of validation concepts and measures that may lead to nationwide arrangements and regulations by 2018. The situation is, however, similar to that regarding the German Qualifications Framework in that reform initiatives are lacking and there is an absence of any will to shape educational policy. Processes are being administered rather than moulded. To many, the inclusion and recognition of informal and non-formal learning in educational and occupational biographies seems an insoluble task which is leading to uncertainty and resistance in many quarters. Power and vested interests are also at stake. Validation may, for example, be perceived as a threat to the existing monopoly of formal learning and the associated bestowing of entitlements. It can, however, also be welcomed as a new and lucrative field of business. As far as the actual objective of validation is concerned, the Federal Council has put the situation in a nutshell. Its official resolution of October 2012 responds to the draft EU Recommendation by saying that the creation of national validation systems constitutes a comprehensive change in learning, credit transfer and recognition culture. We should also add that such a cultural switch takes time, particularly in a country with traditionally established and highly developed formal educational and VET structures. BWP In its Recommendation, the European Council stresses the need to increase employability skills, particularly for the socially disadvantaged and for semi-skilled and unskilled workers. Are there any further arguments for the introduction of national validation procedures? DEHNBOSTEL The validation of competences acquired by informal and non-formal means is essentially justified by lifelong learning, by discontinuities in occupational biographies and by the virtually exponential development in innovation and knowledge in our society. Skills requirements in modern companies are characterised by professionally, socially and personally integrated competences that are developed on an in-service basis. Such a view of comprehensive employability skills is becoming the most important productive force. Certificates recording formally acquired qualifications lose meaningfulness as the date of issue recedes into the past. It is essential for companies and employees to identify and assess the respective status of competence development in the form of a current analysis of occupational proficiency. This should then be compared with target values and strategic goals to draw conclusions for company development and for individual and professional company-based continuing training. The question you addressed as to whether validation can serve as a vehicle for giving socially disadvantaged target groups a second chance and improving their occupational and social status is very difficult to answer at the moment. The opportunity of a second chance was postulated as long ago as the 1990’s, when new work and organisational concepts emerged and the significance of informal learning began to grow. There is now plenty of empirical evidence that the distance between qualifications levels has increased in the wake of the rise in informal continuing training. Instead of an increase in permeability and equality of opportunity, inequalities from school biographies are being reproduced and entrenched. The occupational and social effectiveness of validation therefore crucially depends on the alignment and quality of the procedures. The EU Council recommendation and other EU documents suggest a multi-level validation process. DEHNBOSTEL With regard to validation, as is generally the case with competence assessment procedures, two fundamental approaches can be differentiated – a development-oriented approach and a requirements-oriented approach. The development-oriented approach targets competences which have been acquired in life and in the world of work and accords particular consideration to individual resources and strengths. The process of reflection involved constitutes a learning process in itself. Guidance and support have a particular role to pay in this procedure. By way of contrast, the requirements-oriented approach mainly focuses on competences which are relevant to work and skills requirements and which are stipulated in instruments such as initial and advanced training regulations and skeleton curricula. Assessment of competences takes place with a view to firmly defined standards. Further areas of knowledge or further competences are of no or very little importance in the case of this approach. Validation procedures fundamentally combine both approaches. As far as semi-skilled and unskilled workers are concerned, this means that they are detached from the validation process if there is insufficient development orientation for them. In such a case, validation predominantly strengthens the position of those who are already highly qualified and educationally privileged. Validation comes to nothing for the social groups that make up the so-called labour market reserve. BWP Does this mean that we need to invest even more in individual experiences? What positive examples have we already seen of this? DEHNBOSTEL There has long been a focus on placing a recognised value on experience. This is locked out by the formal educational system, which is aligned towards cognitive and academic knowledge. Vocational education and training represents an exception. The Vocational Training Act and the Crafts and Trades Regulation Code offer a range of opportunities for the recognition and credit transfer of learning outcomes. These include admission to the final examination in a recognised training occupation for persons who do not have a training contract but are in possession of certain experiences in the occupation forming the object of examination. As many as around seven percent of skilled workers complete their final examination via this route. There are also possibilities to credit prior occupational learning to the duration of training and to obtain equivalence for examination certificates. In advanced vocational training, exemption from parts of the examination may be granted in certain circumstances and examination certificates can also be deemed as equivalent. These positive examples need to serve as a starting point. In addition to this, there are diverse recognition and assessment instruments practised in companies and by training providers. The ProfilPASS is just one example of many in this regard. BWP Gathering experiences in the work process requires there to be occasions for learning. How can work tasks and working environments be shaped so as to make them conducive to learning? And what does this mean for validation? DEHNBOSTEL Since the 1980’s/1990’s, workplace analyses and projects have been conducted to foster learning at work. Company-based training work is now focused on organising work in such a way so as to promote learning and competence development rather than merely learning. A series of criteria, such as scope for activity, social support and reflectiveness, have shown themselves to be relevant within this context. These are applied both to the organisation of forms of work such as group work and rotation as well as to forms of learning organisation within the work itself. These future-oriented forms of work and learning are characterised by a high degree of informal learning. Continuing improvement processes and personal development address the learning processes in a targeted way and combine them with competence assessment and validation procedures. BWP You are involved in projects in which validation plays a part. Could you give us a few brief details and state some of the findings for the development of validation? DEHNBOSTEL I am currently participating in four such projects. The EU project “VALERU” focuses on the development of a national system for the validation of competences acquired via informal and non-formal means in the higher education system of the Russian Federation. The findings on which the EU Recommendations are based and the findings arrived at by the participating European countries including Germany show the irreversibility of the validation processes. At the same time, it is apparent that the approaches adopted need to correspond to the different national educational systems and traditions. A “continuing training system for energy technology” (WBS ET) is being developed in a project conducted in Berlin and Brandenburg. In this case, we are striving to create a competence-based validation concept that is intended to have a dual effect. Firstly, competences acquired by informal and non-formal means will be surveyed at the time of entry into the continuing training system in order to be able to undertake recognition and categorisation processes. Secondly, the continuing training leading to certification will be recorded as validation of competences acquired via a non-formal route. The tests and competence assessment instruments deployed in the participating companies will be systematically included and developed further. If the Berlin-Brandenburg project already covers regional requirements and circumstances to a high degree, this is even more true of two other projects in Hessen which are addressing training in the field of old age care. These are the projects “AiQuA” and “aufwärts! In der Altenpflege”. The basis in these cases is the strong regional shortage of skilled workers. For semi-skilled and unskilled staff, achieving a qualification as an old age care worker essentially takes place via learning in the work process whilst continuing with existing contracts of employment. The competence development that occurs is supported and guided, and competences acquired are assessed with regard to their equivalence to the competences listed in the skeleton curriculum for Hessen. 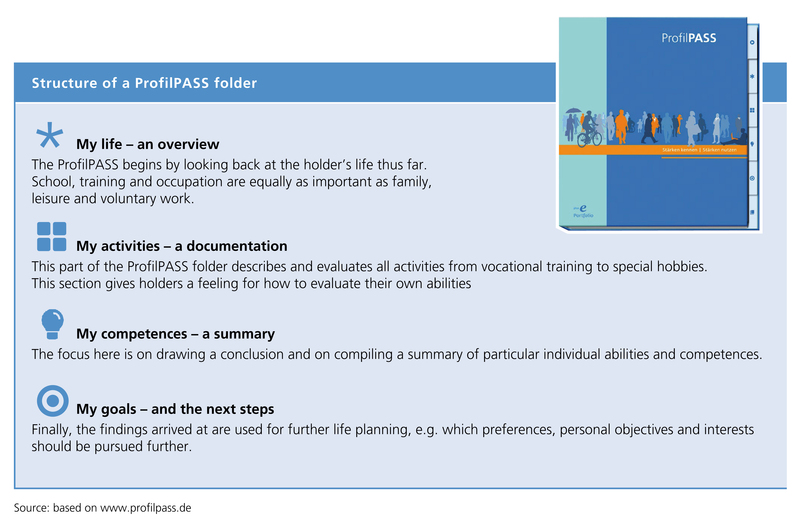 This is the first time that such work-integrated and qualifications-related training models have been piloted in Germany, and they are based on the many years of experience of the participants in the care sector together with their diverse range of competences acquired via informal and non-formal routes. BWP What opportunities do you believe that validation concepts provide? And it is not the case that significant progress has been made at federal state and Federal Government level over the past few years in the recognition of competences acquired by informal and non-formal means? DEHNBOSTEL Validation concepts that address the real needs and requirements of different regions, branches and educational areas are an absolute necessity. There has, however, been insufficient funding for such concepts thus far. As far as education policy and ministry-based recognition of educational and learning achievements is concerned, for years we have been experiencing virtually inflationary Federal Government and federal state regulation relating to the equalisation of vocational qualifications and higher education entrance qualifications and to the credit transfer of competences obtained vocationally to higher education courses of study. These educational policy edicts completely circumvent the competence assessments and validations that are actually necessary. Well intentioned equalisations or equalisations that are opportune in terms of educational policy are undertaken instead. One example is the 2009 agreement of the Standing Conference of the Ministers of Education and Cultural Affairs (KMK), which provides for 50 percent of a course of higher education study to be recognised via evidence of competences previously acquired. But why only 50 percent? Why not 100 percent, such as in accordance with the VAE System in France or pursuant to the Vocational Training Act in Switzerland if this is what the validation produces? How and on the basis of what criteria are the 50 percent recognised? There are definitely established approaches and concepts at individual universities, not least thanks to initiatives such as “ANKOM” and “Offene Hochschule”. Nevertheless, there is a lack of nationally applicable valid and objective procedures. This is an area in which the higher education sector still stubbornly shuts itself off from vocational education and training. BWP Let’s stay with vocational education and training. The question that constantly arises here is as follows. Is the validation of competences acquired outside the formal educational system compatible with the principle of the regulated occupation? DEHNBOSTEL That’s a sensitive point! There is no doubt that considerable risks are associated with the binding integration of informal and non-formal learning outcomes into recognised training pathways such as the dual system and the advanced training occupations. In light of the system developments in many countries, critical evaluations which assume a dissolution of the principle of the regulated occupation and of the dual VET system are justified. One-sided outcome and market orientation produces the danger of giving up on the objectives of comprehensive employability skills and on education that is related to the individual. Fragmentation and segmentation of vocational training through modularisation in regulatory policy terms would in particular bring about such a development. This contrasts with the integration of informal and non-formal competences for expanded vocationalism. The initial and advanced training regulations form the reference and standards for the recognition of competences acquired by informal and non-formal means. Corresponding recognition of modules in higher education courses of study can serve as ac positive example in this regard. If a proper validation concept is in place, there is no need to fear a dissolution of courses of study and study qualifications. BWP Can the upgrading of informal and non-formal consequences lead to inequalities or examples of unfairness vis-à-vis formal qualifications? How should the Recognition Act be viewed within this context? DEHNBOSTEL As already explained, validation concepts which are purely requirements oriented tend to exclude the socially disadvantaged and consolidate existing inequalities. Generally speaking, however, validation creates a higher degree of transparency and fairness in comparison with formal qualifications because actually existing occupational proficiency and employability skills and identified and assessed. The Recognition Act is accorded a special status within this context. Its purposes are the recognition of foreign professional and vocational qualifications and the transfer of partial vocational qualifications. Since 2012, there has been a general legal right to a recognition procedure which relates professional and vocational qualifications acquired abroad to the initial and advanced training qualifications regulated under Federal Government law, which are some 600 in number. The central question is whether there are essential differences between the foreign professional or vocational qualification and the German reference occupation and, secondly, whether any such differences could possibly be compensated for by occupational experience or further evidence of competence. Inequalities and instances of unfairness vis-à-vis formal qualifications and certifications arise when documents used for the equivalence assessment procedure are not objective and drawn up in a valid manner. The consideration of occupational experience to compensate for missing partial qualifications or for absent documents represents a welcome recognition of competences acquired by informal and non-formal means that should take place via a skills analysis. In order to create fair benchmarks and recognition processes, this also means that the two processes which up until now have run in parallel, namely the development of nationally applicable validation procedures and the equivalent assessment procedures pursuant to the Recognition Act, need to be undertaken in accordance with comparable and equivalent criteria and procedural rules. BWP One final question. Which central aspects should be considered for the development of a national validation system so that such a system can achieve broad recognition and dissemination and ultimately be effective? DEHNBOSTEL In this instance, would like to restrict this complex topic area to four main points: the institutional framework, alignment to the German Qualifications Framework (DQR), pilot development and quality assurance. Institutional and organisational assurance to secure the binding integration of standards under public law is indispensable for the development of a national validation system. Recourse to competent bodies is an obvious step in institutional terms, whereby a nationally responsible certification body is additionally recommended by the EU. Rather than creating new organisations, existing organisations should be used where possible and their task and performance spectrum expanded. 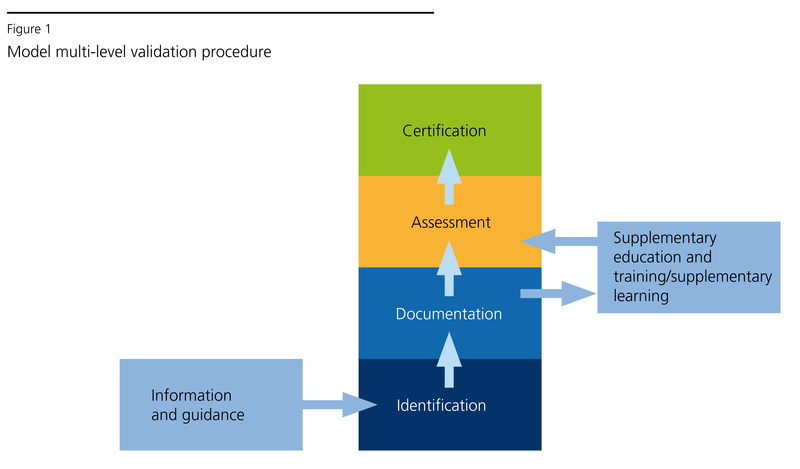 Accreditation procedures such as those introduced in the higher education sector and in parts of continuing training could serve as examples. Within his framework, alignments of informal and non-formal competences to the DQR should also be undertaken. These will not be possible until a broadly based validation system is in place. The pilot development of validation concepts has previously taken place in various branches and in various federal states. National funding is long overdue in order to foster developments and coordinate effects nationwide and within the European context. And finally, more attention needs to be paid to aspects of quality assurance and development in driving forward the development of a validation. A quality assurance system that stipulates processes and areas of responsibility in a binding and transparent manner is certainly a prerequisite for broad acceptance of the validation of informal and non-formal learning within the educational and VET system. This applies to comprehensive validation concepts and procedures as well as to the individual procedural stages of competence assessment, the description of learning outcomes and evaluation. As in other areas, internal and external quality assurance systems are also necessary here.